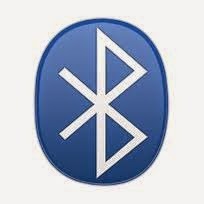 Bluetooth technology is a short-range wireless communications technology to replace the cables connecting electronic devices, allowing a person to have a phone conversation via a headset, use a wireless mouse and synchronize information from a mobile phone to a PC, all using the same core system. The Bluetooth RF transceiver (or physical layer) operates in the unlicensed ISM band centered at 2.4 gigahertz (the same range of frequencies used by microwaves and Wi-Fi). The core system employs a frequency-hopping transceiver to combat interference and fading. Bluetooth devices are managed using an RF topology known as a "star topology." A group of devices synchronized in this fashion forms a piconet, which may contain one master and up to seven active slaves, with additional slaves that are not actively participating in the network. (A given device may also be part of one or more piconets, either as a master or as a slave.) In a piconet, the physical radio channel is shared by a group of devices that are synchronized to a common clock and frequency-hopping pattern, with the master device providing the synchronization references. Let's say the master device is your mobile phone. All of the other devices in your piconet are known as slaves. This could include your headset, GPS receiver, MP3 player, car stereo, and so on. Devices in a piconet use a specific frequency-hopping pattern, which is algorithmically determined by the master device. The basic hopping pattern is a pseudorandom ordering of the 79 frequencies in the ISM band. The hopping pattern may be adapted to exclude a portion of the frequencies that are used by interfering devices. The adaptive hopping technique improves Bluetooth technology's coexistence with static (nonhopping) ISM systems, such as Wi-Fi networks, when these are located in the vicinity of a piconet. The physical channel (or the wireless link) is subdivided into time units known as slots. Data is transmitted between Bluetooth-enabled devices in packets that are positioned in these slots. Frequency hopping takes place between the transmission or reception of packets, so the packets that make up one transmission may be sent over different frequencies within the ISM band. The physical channel is also used as a transport for one or more logical links that support synchronous and asynchronous traffic as well as broadcast traffic. Each type of link has a specific use. For instance, synchronous traffic is used to carry hands-free audio data, while asynchronous traffic may carry other forms of data that can withstand more variability in the timing for delivery, such as printing a file or synchronizing your calendar between your phone and computer. One of the complexities often associated with wireless technology is the process of connecting wireless devices. Users have become accustomed to the process of connecting wired devices by plugging one end of a cable into one device and the other end into the complementary device. Bluetooth technology uses the principles of device "inquiry" and "inquiry scan." Scanning devices listen in on known frequencies for devices that are actively inquiring. When an inquiry is received, the scanning device sends a response with the information needed for the inquiring device to determine and display the nature of the device that has recognized its signal. Let's say you want to wirelessly print a picture from your mobile phone to a nearby printer. In this case, you go to the picture on your phone and select print as an option for sending that picture. The phone would begin searching for devices in the area. The printer (the scanning device) would respond to the inquiry and, as a result, would appear on the phone as an available printing device. By responding, the printer is ready to accept the connection. When you select the Bluetooth wireless printer, the printing process kicks off by establishing connections at successively higher layers of the Bluetooth protocol stack that, in this case, control the printing function. Like any successful technology, all of this complexity goes on without the user being aware of anything more than the task he or she is trying to complete, like connecting devices and talking hands-free or listening to high-quality stereo music on wireless headphones.